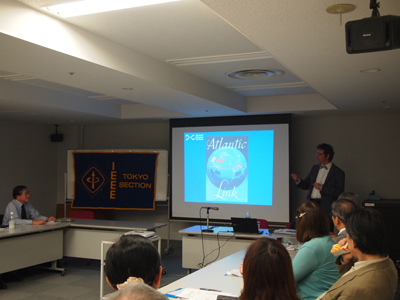 The 2016 2nd Lecture of IEEE Tokyo Section, History Committee and Technical Program Committee, was held on April 25th, 2016, at Kikai Shinko Kaikan with 32 participants. The lecturer was Dr. Klaus Staubermann, Principal Curator, Science & Technology, National Museums Scotland. Dedication ceremony of IEEE Milestone for “Emergency Warning Code Signal Broadcasting System” and “High Definition Television System” was held in Century Room-A at Hyatt Regency Tokyo, Japan on May 11, 2016. 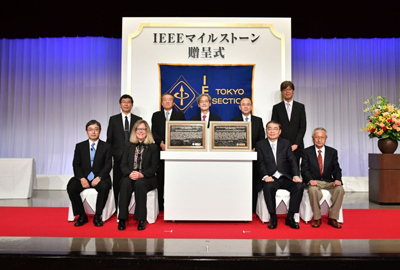 Ms. Karen Bartleson, IEEE President-Elect, presented commemorative plaques to Katsuto Momii, President, NHK (Japan Broadcasting Corporation). NHK (Japan Broadcasting Corporation) developed high-definition television (HDTV), a high-resolution and wide-screen television system designed to convey a strong sense of reality to viewers. Research began in 1964, ranging from psychophysical experiments to system development. In 1989, the world’s first HDTV broadcast via satellite opened a new era in broadcasting. Since 1989, HDTV has spread throughout the world. After the dedication ceremony and celebratory party, the lecture session entitled, “IEEE Milestones Memorial Lectures” was held in Century Room-A at Hyatt Regency Tokyo, Japan with 110 participants. Three lectures of the following have been made.